Preheat oven to 350 degrees F (175 degrees C). 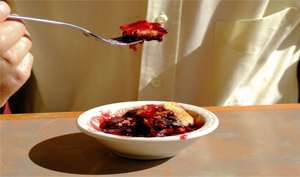 In a large mixing bowl, gently toss together blackberries, raspberries, blueberries, and white sugar; set aside. In a separate bowl, combine flour, oats, brown sugar, cinnamon, and nutmeg. Cut in butter until crumbly. Press half of mixture in the bottom of a 9×13 inch pan. Cover with berries. Sprinkle remaining crumble mixture over the berries. Bake in the preheated oven for 30-40 minutes, or until fruit is bubbly and topping is golden brown.